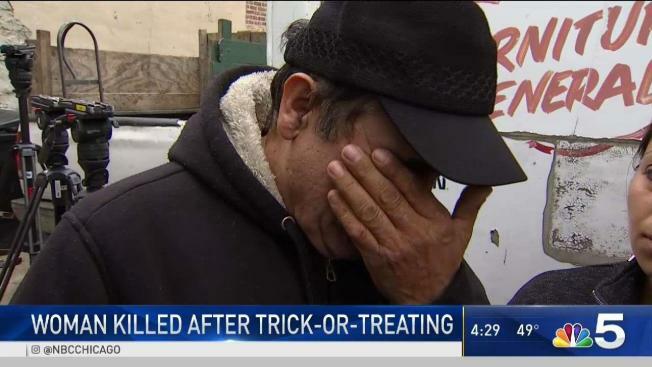 A heartbreaking end to a family's night of trick-or-treating, as police are left to search for a man who killed a young woman right in front of her toddler nieces. NBC 5's Ash-har Quraishi reports. A 21-year-old woman was killed Wednesday night when a robber with a mask jumped in a car, demanded to be driven and then - in front of two children - shot her twice in the head before fleeing with cash, according to Chicago police. The incident took place at around 9:22 p.m. in the 2200 block of North Long Avenue in the Belmont Cragin neighborhood on the city's Northwest Side, officials said. Authorities said Mayra Coronel was a passenger in a parked vehicle, with another woman in the driver's seat and two children in the back, when an unknown male jumped in the backseat of the car and ordered the driver to begin driving. They traveled a few blocks east, stopping near the intersection of West Belden and North Lawler avenues, where officials said the suspect shot Coronel twice in the head before exiting the car and running away with an unknown amount of cash he took from her. Coronel was pronounced dead at the scene, according to police and the Cook County Medical Examiner's office. No one was in custody as of Thursday morning in connection with the shooting, according to police, who continue to investigate.